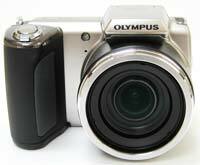 The Olympus SP-620UZ is the successor to last year's SP-610UZ camera, sporting a 16-megapixel CCD sensor and a 21x ultra-zoom lens. Also on board is Olympus' sensor-shift image stabilisation system, TruePic III+ image processor, a range of Magic Filters and a feature that allows the SP-620UZ to combine two separate photos into a single 3D image stored in MPO format. The new model carries over the 720p HD video recording functionality that was already present in its predecessor, and also has a mini HDMI port that allows users to hook the camera up to an HDTV via an optional HDMI cable. 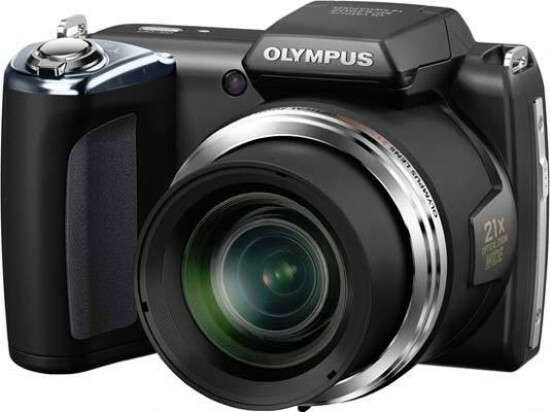 Powered by 4 AA batteries, the Olympus SP-620UZ is an affordable entry into the world of superzoom cameras, priced at £179 / €189 / $199 in the UK, Europe and the US, respectively. With seemingly no let up in the number of super zoom cameras and bridge models being released, despite the fact that compact system cameras and HD video shooting DSLRs are arguably the latest and greatest thing, Olympus swells the ranks with the 16 megapixel SP-620UZ 'Ultra Zoom'. Marking 10 years of the SP range the key appeal here is, inevitably, jack-of-all-trades convenience and the ability to frame up everything from fingernail sized close ups to skittish deer a hundred metres away without actually moving a muscle. That takes precedence over and above necessarily pin sharp results. Available either as silver or black body in the UK, the SP-620UZ is an upgrade of the £150 14MP SP-610UZ, and if there's one thing that stands a budget-priced Olympus zoom apart from the pack it's the pared-down appearance. Here, unlike say the much pricier Fuji X-S1, we have a body uncluttered by DSLR-like controls and buttons. Indeed the Olympus SP range seems to be coming more from the starting point of a regular compact, with all the user friendliness that should imply. Albeit it's a compact that's been 'pimped' by virtue of having a stonking great lens stuck on the front. One downer is Olympus' latest offering feels a little plastic-y in spite of the disguise of our sample's metallic finish. Plus, while not ugly, its largely frill-free blocky-ness wouldn't win any Red Dot design commendation. However the four AA batteries required for power that slot into the base of its handgrip do however provide a degree of weight (at 435g all in) and reassurance. With a recession-friendly price tag that won't break the bank at a suggested £179.99 (so expect street prices around £150-160), the undoubted draw here is the girth of lens you get in return. It's a 21x optical zoom with a maximum f/3.1 lens aperture providing the 35mm equivalent of 25-525mm, and achieving focus as close as 10cm from a subject, in macro mode at least. Curiously this lens starts out wider but winds up shorter than its predecessor's 28-616mm reach. The zoom is once again supported by dual image stabilization. As we've noted before, one can't argue that such a reach provides a wide variety of framing options, allowing the photographer to self engineer everything from wide angle landscapes to candid close ups. That said, with the latest pocket travel zooms offering up to 20x zooms and more portable proportions still, there is increased competition if all you want is that extra 'poke'. So how does the Olympus SP-620UZ, incorporating a TruePic III+ image processor and 1/2.3-inch CCD as its engine room, measure up? Though our expectations may be modest, as we'd expect on any camera being released in 2012, HD video recording is offered alongside stills. Here a dedicated button top right of the backplate is provided for the purpose. While its location means that it falls readily under the thumb for one-touch activation when gripping the Olympus right handed, we found ourselves accidentally nudging it when carrying the camera along and commencing recording of maximum 1280x720 pixels clips. Likewise, we found ourselves accidentally pressing the on/off button on the top plate with a forefinger when gripping the camera firmly enough to slide open the stiff plastic battery compartment cover at the SP-620UZ's base. In both circumstances there seems to be little alternative space to place digits, so such occurrences become numerous and frustrating. That said, this model does feature what Olympus is calling Multi-motion Movie IS - an intelligent image stabilization feature that is supposed to improve results when filming and walking at the same time (See our video clips for a deliberately 'carelessly' filmed example of just that). In the absence of an electronic or optical viewfinder, thereby keeping proportions that much more compact than say Fuji's HS30EXR, we're reliant on the fixed, non-angle adjustable LCD at the back of the SP-620UZ for shot composition and review. Though the ubiquitous 3-inches in size, the resolution is a relatively meagre 230k pixels by today's standards, In other words the same as your average sub-£100 snapshot. Clearly this is a camera designed to meet a pre-destined budget friendly price point, and junior place in the range, with the equally fresh 26x yet 14MP SP-720UZ (also launched at January's CES) perched just above it. This being an Olympus camera, among the shooting options discovered by tabbing (or scrolling) left and right through the shooting modes - there is once again no dedicated dial - are 11 'magic' effects filters, which help set Olympus apart from the crowd. The options here applied at the point of capture are the dayglo photocopied effect of Punk, colour boosting Pop Art, plus the self explanatory Pin Hole, Drawing, Fish Eye, Soft Focus, Sparkle (adding a starburst effect to reflective surfaces), Watercolour, Miniature, Reflection and new this time around, a 'Fragmented' filter. It's worth noting that while most of these can be put to use for video as well as stills, the new fragmented along with sparkle are photos-only options. Also located in the same shooting mode section of the toolbar as the Magic Filters are both a 3D photo mode and a panorama mode. The latter doesn't shoot a rapid burst of files as you pan left to right and stitch them together to form a 360°; no it's more modest in its aims and simply conjoins three frames, that the user marries up at the point of capture by keeping the camera level with a target that wobbles about on the centre of screen in between sequential shots. 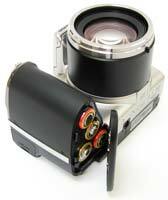 The SP-620UZ does however still automatically stitch together the final elongated result. As expected, the 3D mode uses software rather than twin lenses or sensors to achieve its tri dimensional trickery - promoting you to take two adjacent shots from slightly differing angles to form the end result that naturally requires a 3D TV or monitor to enjoy. An HDMI output port is provided under a rubber side flap for connectivity purposes. Should, as when watching an IMAX movie, the process of using the Olympus get at all overwhelming, help is at hand with a press of the '?' button located bottom right of the backplate. This is the regular in-camera help guide, for those who wish to bypass the hard copy manual. 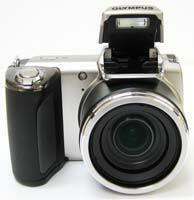 In general terms though, Olympus expects your usage of the SP-620UZ to be of the point and shot variety. There's no automatic lens or clip on cover provided here. Merely a simple plastic cover that slips on, and one the user therefore has to remember to remove before powering the camera up. Press the narrow lozenge shaped on/off button - the only control to feature on the top plate apart from a large raised shutter release button encircled by the equally obvious zoom control lever - and provided the time and date have been pre-set the Olympus is ready for action in around two seconds. The lens barrel immediately extends a couple of centimetres beyond its housing to its widest zoom setting, whilst the rear 230k dot LCD blinks into life. Squeeze down on the shutter release and while AF is not quite instant like on the Olympus Pen models, here there's the briefest pause before the AF point appears, highlighted in green with an accompanying bleep of affirmation that the user is free to squeeze down fully and take the shot. Do so and a single shot full resolution JPEG is committed to memory - here removable SD card, with wireless Eye-Fi compatibility further offered - within 3-4 seconds. Not the fastest ever, but commensurate with what is an inexpensive entry-level bridge model. And, as it is such a model, we don't get the option to shoot Raw. Instead optimum quality is provided by selecting a Fine compression level, as opposed to the alternative of 'normal' compression, for its 16MP JPEGs. Nudge the zoom lever and the SP-620UZ relatively rockets through the available focal range, reaching maximum zoom from extreme wideangle setting in 2-3 seconds. That's in stills mode at least. 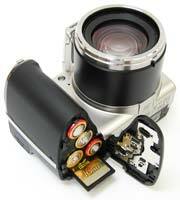 For shooting video you can use the optical zoom or record sound, but not both simultaneously. Try to use the zoom without first turning sound off within the camera's menus and it won't budge. The only option if you want sound and a zoom is to deploy the digital zoom, which is a little unsatisfactory. As physical controls are kept to a minimum on the spare-looking SP-620UZ, there is no immediately identifiable shooting mode dial or menu either, nor is there seemingly a dedicated modes button. Instead these are selected via a toolbar that appears upon power up and is ranged to the right hand side of the LCD. A press of the 'OK' button at the centre of the SP-620UZ's backplate scroll wheel/control pad highlights a shooting setting. A scroll or tab left or right subsequently reveals the other available shooting options, hidden until now. Only the shooting mode presently selected denoted by an icon at the top of screen - 'P' for Program mode for instance - is constantly visible. Apart from Program we also get a fairly reliable intelligent auto mode with AF tracking, allowing for simple point-and-shoot operation, plus a 'Magic' mode that provides access to the aforementioned Magic Filters. Next up is the Panorama mode already touched on and adjacent to this the 3D mode. Like the panorama mode the shutter immediately fires when you have 'married' up the two separate images on screen, with a ghost outline provided as a guide. Although you can't see the 3D effect on the back of the camera, you can at least view a 2D version so you know that you've got the shot. The only one of the six available shooting modes we haven't mentioned is that for 'scene'. Press 'OK' with this option highlighted and a bar slides out offering the following 17 user selectable choices: beach and snow mode, separate pet modes for a cat and a dog, standard portrait mode, enhanced beauty mode, landscape mode, night scene mode, night portrait, self portrait, sunset, plus fireworks mode, sports mode, indoor mode, self portrait, sunset, cuisine, and finally text documents mode. The top edge of the backplate scroll wheel is marked with 'info' while above this again sits a self-explanatory playback button. Give the edge of the wheel a nudge and all on-screen shooting info is deactivated apart from the icon showing whichever mode is in play, while a subsequent nudge brings up both a nine zone compositional grid plus, more unusually at this price point, a live histogram, revealing the areas of brightness in the image. Apart from the aforementioned shooting modes, in tabbing down the right hand toolbar the user alights on additional key shooting settings, with the widest range of options unsurprisingly provided in Program mode. Flash settings are here for example, though you have to first manually raise the flash - there's no automatic pop up operation, nor even dedicated activation lever. Flash options are limited to fill in/forced flash, flash off, auto activation and flash with red eye reduction. Gingerly tab down one setting - we say gingerly, as otherwise the overly responsive scroll wheel is want to send you flying forward two settings at a time - and arrive at macro focus option, here divided between regular macro and 'super' macro. One more setting down and we arrive at self timer mode, which provides the standard two or 10 second choices, while below it sits the exposure compensation setting, running between +/- 3EV. Following on from this are the ability to manually adjust white balance, and ISO settings, the latter running from ISO80 to ISO1600 with additional Auto ISO and High auto option. Lastly there is the ability to access the drive mode which is divided by the default of single shot, continuous 0.65fps mode at full resolution or two high-speed sequential shooting modes, for those interested in using the zoom for action photography. Select the latter two modes and resolution is reduced to five megapixels if shooting at 5.3fps and an excusable three megapixels if choosing a rather more impressive than average 14fps. As expected we also get a dedicated 'menu' button on the SP-620UZ's rear plate. A press of this and we're presented with no fewer than seven folders, with two stills shooting folders, one video folder, one playback folder and three set up folders. All contain standard settings. It is among these that the user selects image size and JPEG compression for example. We also get a chance to implement Olympus' exposure enhancing shadow adjustment technology, leave it on automatic for the camera to choose or simply turn it off altogether. AF mode can also be swapped between face recognition and AF tracking, plus image stabilisation turned on continually or activated only when making an exposure, not that there's a noticeable difference. Video clip size can also be switched between top 720p (progressive) capture setting and standard VGA (640x480 pixels) or QVGA (320x240 pixels) settings. The previously mentioned IS movie mode is also turned on or off via the same menu. Set up, meanwhile, provides the ability to format the memory in use among other standard options. It's worth mentioning that the bottom edge of the scroll wheel/control dial features a dedicated delete setting - which is always useful to save otherwise having to delve into menu settings just to delete the odd duff shot. While the left hand flank of the camera, if viewed from the back is devoid of any features save a built in mono speaker, the right hand side of the camera features a flap covering two ports, the larger one for HDMI output and the smaller for standard USB 2.0 connectivity. The base of the SP-620UZ meanwhile features a centrally located screw thread for a tripod attachment, plus a covered compartment housing the four AA batteries plus optional SD/SDHC or SDXC card. There is also a 59MB internal capacity to fall back on. All the above makes for a pretty straightforward camera with equally straightforward operation, matched to an equally transparent price. While that ensures the Olympus SP-620UZ ticks the boxes for ease of use, value for money and on the whole for responsiveness, how does the camera match up when we get to the crux of the matter: image quality? Read on to discover more.